It's been almost 4 years now since I began working to rewrite my bad sleeping habits. It was around that time that my first son Malik was born, and my personal time began to (really) take a nosedive. I had already been working for years on figuring out what I wanted to do with my life, and then when I found it, committing myself to it. I wanted to give my wife and I, and later our growing family, a "better" life. But it wasn't until my first son was born though that I had to heavily reevaluate my life and how I spent my time. That was a real turning point. For a while, I tried staying up extra late to work on my personal projects. But having a traditional work schedule on top of taking care of my son really made that difficult. A schedule like that was completely against not only my son's sleep schedule but, as I would later learn, our bodies natural rhythm. One day, I ran into an old article about Zen Buddhist monks sleep schedules. Knowing little about their day-to-day schedules at the time, I was really interested to find out that they typically had sleep schedules somewhere around 10-11 P.M. to 3-4 A.M. The article talked a bit about the reasoning, mentioning some things such as the body's natural rhythm, the fact that apparently experienced meditators seemed to need less sleep, among other things. What really caught my ear was the bit about it being more conducive to our body's natural rhythm, and apparently adopting a schedule closer to this rhythm helped us feel happier and be healthier. That was easily one of the two biggest convincing factors to getting me to start waking up early. I didn't know if it was true, but it convinced me to try. I also did some calculations, guesstimating what time I'd go to sleep (on average, kids really make this fluctuate) and wake up, and realized I'd actually get more time to myself as well as improve the quality of my sleep by going to bed, as well as waking up, early. So I set out to do the unthinkable: I, the certified night owl since age 15, would begin waking up early. Fast-forward 4 years and I now wake up between 3-4 A.M. daily (you can read about how I did it here). It was a gradual process, chopping off thirty minutes to an hour every couple of months, but it was so worth it. What began as a way to get some extra time and maybe feel a little more balanced quickly turned into one of the single best decisions of my life. It took a while to shift my schedule over, but my new schedule, even just starting out waking up at 6:30-7 A.M., made me feel great. I felt more alert during the day, my mind felt clearer and more at ease, and the quality of the time I got to myself was much greater. I wasn't half asleep for the last hour or two of my personal time, like when I'd stay up late. After a few minutes of shaking off the sleepiness, I was awake and ready to go. And it was so peaceful and quiet in the morning that once I started waking up early I knew I'd never go back. I learned that what you do when you first wake up in the morning is a firm indicator of not only the quality of the day you're going to have but by extension, the quality of your entire life. Committing to a few positive morning rituals each day can absolutely change your life in just about every way imaginable. Becoming an early riser and making the most of each morning is about striving to get the most out of your life. You can use these 7 positive and healthy morning rituals to take command of your day and begin writing your own life's story, instead of letting life write it for you. My morning schedule has changed many times over the past couple of years. Some things were experimental, some things I just got bored of (which is dangerous, because if you're not looking forward to waking up- you likely won't), but for the most part any change in my morning schedule has been because of my evolving spiritual practice. Below are 7 healthy morning rituals, all of which I've done personally for an extended length of time and can heavily vouch for. I don't do all 7 of these rituals in one morning, nor have I ever. My morning schedule consists of usually 3-4 activities, some being daily activities and others being once or twice-weeklies. I'd suggest starting out by picking 1-2 of these to do each morning and expanding from there. This is what I do when I first wake up (on most days). For a long time, I wrestled with the difficulty of meditating immediately upon waking up. When you do that, you essentially sit down and go back to sleep. It's really difficult to have just woken up and sit down to meditate because you're just dozing off the entire time. Bringing in a simple tea meditation ritual changed all of that. I drink mostly green tea, partly because that's just what I've drunk for years but partly because of the caffeine. I'm not a coffee drinker, so the caffeine in the green tea is the perfect wake up call. After I drink my tea I'm alert enough to sit in meditation without dozing off, so it's really worked out nicely. Admittedly, this is one of my favorite parts of my day. I call this tea meditation, but when you fully engage yourself in what you're doing with mindfulness everything becomes meditation, so this is really just "drinking tea", nothing more than that. 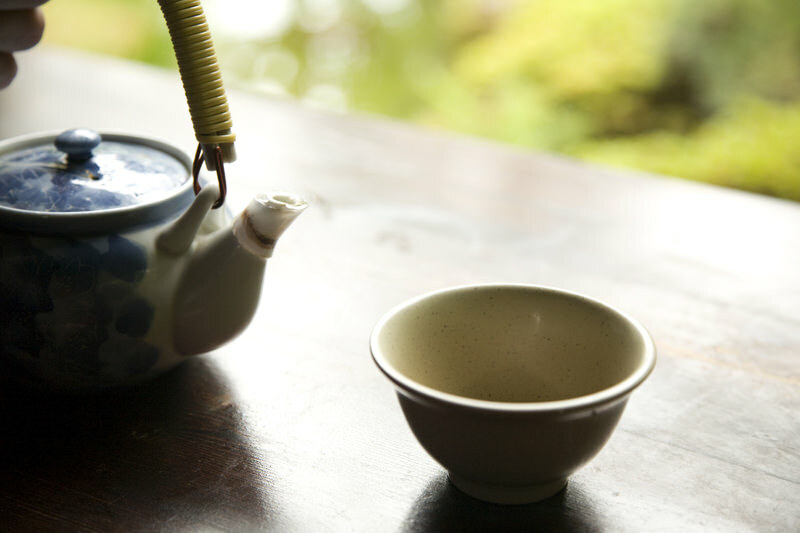 To do tea meditation, you simply need to do every part of the tea making and tea drinking process with mindfulness. Take your time making your tea with mindfulness- heat up your water, get your cup out, pour the water, and sift the tea. Then, take your tea and sit down in a quiet place with it. Drink your tea like there's no tomorrow. Drinking this tea is the most important thing in the world. When I sit down with my tea, after each cup I pour I sit the cup down in front of me, put my hands together, and give thanks for the tea. I bring my awareness to all those people who have to live with the threat of death from dehydration, and all those people who simply don't have enough. I make sure to first fully respect the tea and express my deep gratitude before drinking it. After paying my respects to the tea, I simply drink it slowly with mindfulness. I usually drink a few small cups (about 1/4 of one cup at a time), but you can drink however much you'd like. You can shorten the practice down to just 10-15 minutes from start to finish by drinking only one small cup and drinking at a moderately slow pace. After I'm done I put my empty cup down in front of me and give thanks once again for the tea. I do this for each cup of tea I drink. This is my cornerstone practice and what I do every morning immediately following my tea meditation. While tea meditation has become an important practice in its own right, I adopted it solely as a way to be able to meditate soon after waking. Before I started doing tea meditation, I would sit down to write for a few hours before meditating, because otherwise I'd just doze off and have a very ineffective meditation session. I sit down once, occasionally twice in the morning typically for 45 minutes to an hour. Over the years my meditation sessions have lengthened, starting with just 5 minutes a day in the beginning. I mostly let myself develop naturally, never advancing to a lengthier session unless I felt totally comfortable with my current session length. If there was one practice on this list that I'd say do every single day with absolute dedication, meditation would be it. Most everything else can fluctuate to some extent, but a daily practice of sitting meditation is one of the most powerful daily practices there is and really should be consistent if you want to get everything you can out of it. The morning is a great time to flex your creativity. When a novice monk or nun begins studying Zen, many times, if they have any natural inclination towards art within them, as time goes on they naturally begin to create art of some fashion more regularly. It's difficult to describe in words why this is, but imagine you're a tuning fork. Through your spiritual practice, you're attempting to attune yourself to the ultimate, the one in the all and the all in the one. When it gets down to it, realizing this is really the central idea behind all spirituality. So through your practice you gradually begin to tune yourself closer and closer to it, and when this happens you naturally wish to express the all becoming the one, or the great expression of life coming to be in this moment. This is what art really is, and the morning silence is the ideal time to look within yourself and feel a deep connection to the world around you. This brings out your natural creativity, and self-expression that comes from it is natural and nourishing for the mind. About once or twice a week I practice Zen calligraphy. I used to draw a lot back in high school but stopped over time and just never came back to it. Zen has uncontrollably possessed me to express myself with pen and paper once again, and it feels great. If you've practiced drawing, painting, or anything else before or want to start doing so then the morning is a great time to do it. And flexing your creativity in the morning is a great way to get your creative juices flowing for the rest of the day. Being a writer, this is what I do with most of my time in the morning. But I don't want to talk too much about my writing practice, I want to talk about the benefits of writing in general. Writing has become one of the most beneficial practices of my entire life. Writing opens you up and spurs you to bring form to thoughts and ideas in your mind like nothing else can. If you're going through a tough time, trying to figure something out, or gain clarity about something then writing is the most powerful exercise I know to do so. I can't fully describe how powerful it is to take ideas in your head and have to figure out how to place them down on paper. This isn't always ideal, language has its limitations, but writing is a powerful exercise with great benefits nonetheless. And whether you're a writer or not, you can get these same amazing benefits. You don't have to good at writing, you simply need to write. If you're trying to figure something out, anything really, just sit down and write about it. Even better, imagine you're writing TO other people. This is part of why writing has been so powerful for me, writing something I know other people are going to read can be a lot of pressure, but it can bring a lot of great things out from within you. Writing itself is its own meditation for me. I just put my hands down on my keyboard and let whatever comes out of me fill the page. This can be really revealing, but also very therapeutic. I kept a journal for about a year and would highly suggest it. I used Day One on my iPhone, it was absolutely my favorite method of keeping a journal. I've since stopped regular entries, but not for any particular reason, though. I suppose it was mostly just to keep my efforts focused on a few things and not to over complicate my day/mornings. Keeping a journal has all kinds of benefits. There are a couple different ways you can choose to keep a journal, the first notable way being to note all the good things that happened on a given day, however small. This form of keeping a journal can help to increase your confidence, make you happier, and give you better perspective during days that seemed tough and unproductive. Another way of keeping a journal, and to me the most powerful, is what I'd call a mindful journal. It's essentially keeping a journal and noting down any thoughts or feelings you have throughout your day. You don't have to note down everything, mostly just those things which were unexpected or needed some introspection, but keeping a journal in this way can be a great partner to your meditation practice. This is why I originally decided to wake up early. The peace and quiet of the morning is unparalleled, so it's a great time to work on anything you want or need to do. If you're still figuring out what you want to do with your life, or you just want to have some fun doing something you love, design a fun project around it and do a little each morning. The uninterrupted time of the morning is easily the most productive part of my day and the perfect time to stretch your creativity as I mentioned earlier. I trained in various martial arts for years, up until just a few years ago, a little while after I began waking up early. So training and working out were one of the things I did the most in the morning at first. I decided to stop training years ago, but I can vouch for exercise of just about any kind being a great morning ritual. The morning is a great time to go for a run too. It's so quiet and peaceful in the morning, you could go for a mindful run and have little interruptions. What you do in the morning has an uncanny ability to set you up for the rest of the day, so the energy and vitality you get from exercise is a great thing to do in the morning as it keeps you energized for the entire rest of your day.